Daras system, Lonetrek region. On the 2nd of October at 20:00 EVE standard Time, Northern Coalition. [NC] fought Project.Mayhem. [16-13] in the system. The battle was prompted after Northern Coalition. discovered a large Project.Mayhem. fleet making its way home after destroying its towers in the nearby Tamo system. The fleet, a 120 pilot Machariel battleship fleet with dreadnought and force auxiliary support, was en-route to the Nalvula system where the alliance stages. However, as the sub-capital fleet was warping to the Otalieto gate in the Daras system, Northern Coalition. forces bridged in and moved to intercept it, warping to the gate gate a 150 pilot Proteus strategic cruiser fleet, with a wing of dreadnoughts and super carriers held in reserve. The two forces landed one after the other on the gate, prompting Project.Mayhem. to engage the Northern Coalition. forces on the Otalieto gate. The two sides opened fire at point blank range, the two fleets tangling up. Auto cannons fired high speed rounds at the moving strategic cruisers who retaliated with salvos of super heated plasma and laser fire. For a few minutes, both sides exchanged only minor casualties as the logistics wings of the two fleets strained under the pressure to keep their comrades alive. However, with the amount of firepower on the field, both sides required reinforcements. In quick succession, both fleets lit cynosural beacons on the field, ushering in Apostle force auxiliaries. Northern Coalition. also brought in 2 dreadnoughts fitted with high angle capital turrets to target the many Machariel battleships present. Even with the dreadnoughts in, Project.Mayhem. was able to reasonably soak the damage thanks to its own 2 Apostles, which forced Northern Coalition. to further escalate, bringing in more dreadnoughts in order to destroy them. As the dreadnoughts hit the grid, they entered siege mode, targeting the enemy’s Apostles and unleashing devastating barrages of fire. Seeing this, Project.Mayhem. chose to further escalate, bringing in a squadron of its own dreadnoughts. Hitting the grid, the Project.Mayhem. capitals started to return fire, targeting the hostile dreadnoughts and turning the battle into a close quarters capital brawl. Both sides started to focus on each others’ capitals, with the sub-capitals weighing in with their own formidable fire power. Within moments, dreadnoughts and force auxiliaries were torn apart, capital munitions and sustained sub-capital fire overcoming shields and punching through armor plates to cause havoc on the structure beneath. Explosions lit the Otalieto gate as the behemoths breathed their last, their reactors breached, engulfing their innards in storms of fire that were quickly extinguished by the cold vacuum of space. As the carnage continued, more and more of these enormous wrecks littered the field, drifting between the warring sides. In the end, Northern Coalition. won the capital exchange, as it kept jumping in dreadnoughts, easily overcoming both the Project.Mayhem. Apostles and retaliatory dreadnoughts. With the Apostles gone, the full wrath of the Proteus fleet and its dreadnought support fell on the battleships, easily overcoming what meager logistics cruisers it had. One by one, battleships were simply incinerated by focused bursts of plasma and laser or exploded after receiving crippling damage from dreadnought munitions. The Project.Mayhem. 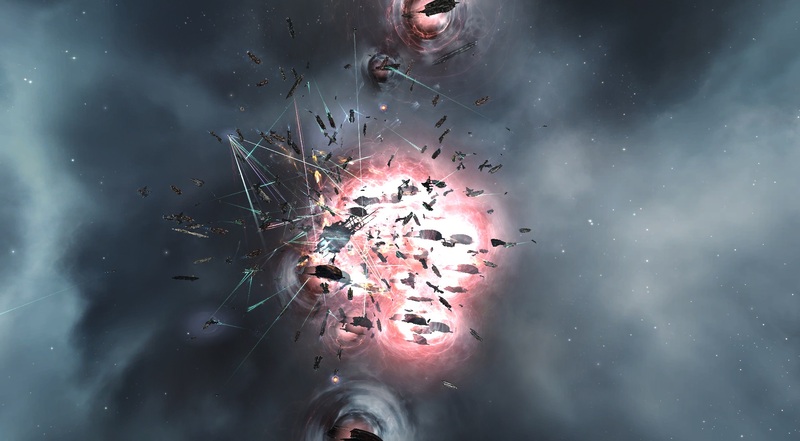 fleet commanders realized the fight was lost and made their way to the gate again, holding their fire to clear their aggression timers and jump out of the system. Northern Coalition. continued to fire, a stream of dreadnoughts pouring in as well as 2 squadrons of super carriers which were held in reserve. The super carriers jumped into the heart of the battle and unleashed their swarms of fighters, targeting the now vulnerable battleships. By now though, most of the Project.Mayhem. fleet managed to clear its aggression timer and jumped out, leaving the Northern Coalition. to mop up the field. With Project.Mayhem. managing to extract the majority of its fleet intact, Northern Coalition. dispatched of the last stragglers before reinforcing Project.Mayhem. towers in the system. Finished with their task, the Northern Coalition. forces safely extracted from the area, bringing the fight to a close. The Battle from the Perspective of the Northern Coalition. Proteus Fleet. Battle report for the Daras system can be found here. The battle lasted 12 minutes from beginning to end, with the system hosting approximately 300 pilots and Time Dilation not reported by any of the combatants. Project.Mayhem. lost 22 ships including 5 dreadnoughts, 2 force auxiliary and 5 battleships for a total of 40.41 billion ISK. Northern Coalition. lost 5 ships including 3 dreadnoughts for a total of 9.71 billion ISK. Salivan Harddin is a member of V0LTA, WE FORM V0LTA, and covers battles across New Eden. Thanks for finally talking about >Low Sec Rumble: Ambush in Daras – Eve News24 <Loved it!